For the last six years, I've avoided driving to work, only taking the bus when it's too icy to ride. Our younger son also commuted by bike, until a change in circumstance changed his commute to include a busy road and a long climb. At the same time, my commute changed from 14 miles to between 24 and 30 miles, including dropping my son off, so I had to choose between getting a car and finding another kind of bike to ride. Even though I had been riding and commuting by bike since the mid-90s, I had never ridden anything which other than a road bike, let alone an electric OR cargo bike. I looked at some other shops, searched online, and would up at SloHi where I went to ask questions and test ride a bunch of bikes. My research and my test rides kept steering me towards the Tern GSD, until they finally arrived and I rode home on one. That was four months and 3000 miles ago, here’s what I learned along the way. Most of what I share can be accomplished with a different bike. There are front-loader (bakfiets) cargo bikes which have a low center of gravity, there are dozens of great long-tail cargo bike options, and there are hundreds of good options for comfortable commuters. However, very few of them fit in an elevator. This is a deal-braker for me. It doesn't matter how capable and awesome a bike is if I'm not able to store it. The Tern GSD fits into the passenger elevator which provides the only access to my building's bike storage room and I am able to lock it up in a standard bike parking space. Like its size, everything about the GSD is different than a normal bike, but at the end of the day, is just like a normal bike, especially when it comes to the riding experience. It looks different, but the riding position feels normal--it's highly adjustable between a fully upright and fairly aggressive riding position. You can set it and forget it, or if multiple people are sharing the bike, the seat height and handlebar position are both adjustable without tools, and rock solid when locked down. The trade off is that the release levers and integrated headlight on the handlebars don't leave room for my phone mount and handlebar bag. I rely on this bag during the winter for my 3 different pairs of gloves, two different hats, face mask, keys, etc... I plan to relocate this bag to the front rack once it's installed. I'm also still looking for a way to get my phone mounted in the center where I like it. 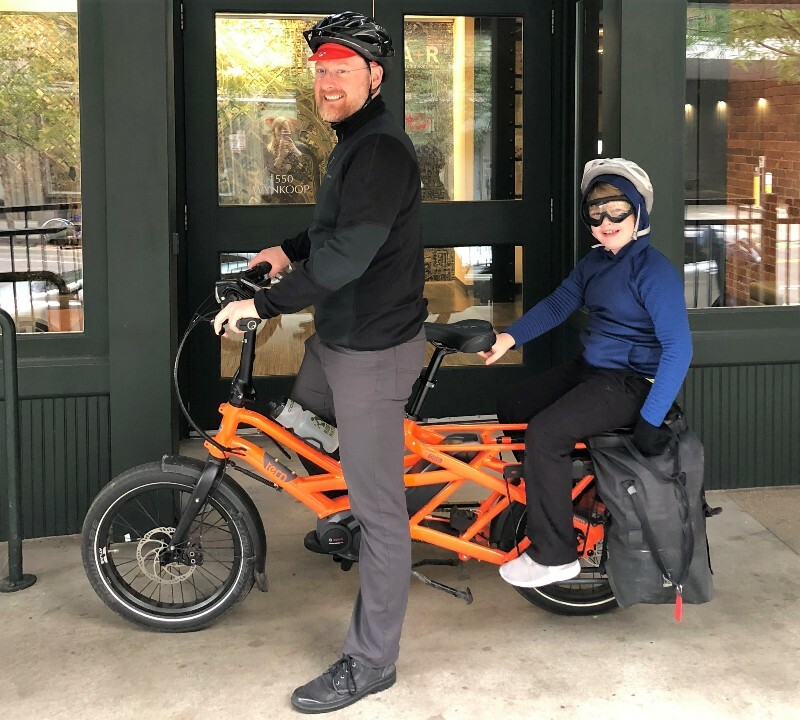 When we were purchasing the bike, we assumed that we would need to add a second handlebar above the rear passenger deck for my son to hold onto but decided to give integrated handle under the saddle a try first. It works. As it turns out, the ride is so stable that passengers quickly stop holding on at all and the handle only gets used sporadically for reassurance on bumpy stretches. I asked my son how he was holding on and keeping his hands warm and he said that he was just putting his hands in his pockets. He had not been holding on for months and I did not even know or notice. I credit the GSD's amazing stability to its very low center of gravity. Because the rider is the only weight on the bike that sits above the wheels, the more you load up, the more stable the bike gets. At a hundred pounds, my sidekick is closer to an adult than a child which just reinforces the amazing passenger capacity. As we pull up to the school drop off zone every morning, my son is able to turn from a standard riding position to side saddle and dismount before I come to a complete stop without any wobble in the ride. It is that stable. Speaking of passenger safety, we also added the “Sidekick Seat Pad” (because cold metal is no fun to sit on) and the “Sidekick Lower Deck.” We considered the retractable foot pegs, which would have been better for adults (yes, I have taken friends for joy rides), but the Lower Deck's rails offer some other advantages, such as more flexible foot placement and easier mounting and dismounting. They have also proven very valuable for mounting my tripod when going on photo excursions or strapping on larger cargo. Weight is one thing, but the rails make it easier to carry large awkward things and boxes. That said, when I first added them, the rails didn’t leave room for my initial pannier setup. To start, I added mounts on the back of the GSD for four Chrome Rolltop 20 panniers (Reusing the two from the front and two from the back from my old bike). Before adding the Lower Deck, the brackets for the panniers attached perfectly and were much easier to attach than to the standard racks I had on my old bike. The problem is that from the integral pannier mounting rail to the the top of the Lower Deck is only 12 inches, the panniers need 14 inches. Once I added the Lower Deck the panniers sat too high to clip in so had to make myself a custom bracket which used the mounting points for the Tern Clubhouse to mount the panniers. This has proven to be a rock solid and elegant solution but was a huge extra step which took a whole weekend to figure out and execute. If you plan on using rear panniers with the lower deck, I recommend trying them out or taking some measurements first. The Sidekick Lower Deck made it a pain to install my favorite panniers but it was worth it for several reasons. First, I know and trust the Chrome Panniers through any weather with my laptop, ipad, camera gear, drawings and dry clothes. The surprise benefit is the flexibility of carrying gear and a passenger. Most days I only carry one pannier for me and one for my son which mount in the farther back positions completely out of the way of his legs. Tern’s GSD-sized Cargo Hold Panniers were tempting but would have gotten in the way of his legs and feet sitting on the rails. When I need more capacity, I just add the other two panniers in the front position. This does mean that I need to go solo for grocery shopping, but also that I can carry an entire grocery cart worth of food. I don’t don’t have anything to say about the lights, brakes, or motor because they just work, I am never aware of them at all. I just had SloHi do a full tune-up after 3000 miles, and in that time the closest thing to a problem was the chain dropping twice--both times while down-shifting. Not a big deal but the chain guard on the motor makes it time-consuming and messy to get the chain back on. Since then SloHi taught me how to use the clutch to choose between better chain retention and smoother shifting. Given that I’ve only had two problems in 3,000 miles, I am going to risk keeping the silky-smooth shifting. 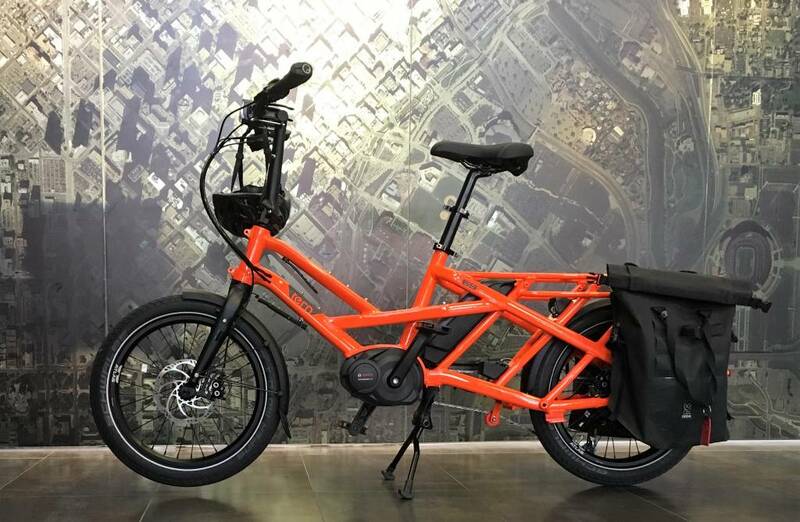 Now you know all about the “cargo bike” half of the GSD, but what about the “electric” half? Am I really biking 120-180 miles a week? Yes and no. When I first switched to the GSD in August, the weather was great, my longer commute had not started yet and the only gear I was carrying was lunch and a change of clothes. The 1x10 gearing and shifters are ideal for the bike and allowed me to do my old 14 mile commute without even turning on the motor. With the motor in Eco mode it felt like I was back on a road bike without all the extra stuff. I still got a workout on my commute, I just felt more comfortable. In summer, unloaded, turning on the motor felt like cheating. Now, in winter, in the dark, with a 100 pound passenger and cargo, uphill, in traffic, I use the motor in full turbo mode and it feels empowering. In this mode, I cannot compare it to other bikes, I have to compare it to a car. I am “biking” as more than ever but I am also doing things which no other bike could do and having fun doing it. When I am sitting at a stoplight looking around me, I am the only one in traffic who is smiling. Changing through the assist levels on the no-nonsense controller is easy and intuitive. The motor is invisible, but the battery is not. Riding 24 miles and 300 feet round dtip with just me and my gear in “tour” mode I get about 2 round trips or 50 miles from the battery. I’ve done the same trip with my son on the back, increasing the power level so that my speed and cadence are the same and the battery lasts 1 round trip, 25 miles. What really drains the battery is taking him to school because this is the same 300 ft climb but only in 3 miles. On those days a full charge is barely enough for the round trip of 30 miles and on a few days I have run out of power making that final climb a lot slower. On those days I need to charge at work to get the 36 miles I need. These ranges are all with me riding at a constant 18-20 mph, which is itself a big deal. Even fully loaded, uphill, I hold about 16-18 mph. With the battery dead, my speed drops to near my average riding speed on my old commuter. The adage that e-bikes flatten hills and shrink cities is true. I am lucky that all but two miles of my commute is along beautiful creek and river trails. At about an hour each way it is 15 minutes slower than driving and 30 minutes faster than Public Transit. The bike is comfortable and fun for that. My son complains about the cold once in a while and complains that he cannot ride his own bike to school anymore, but generally has fun as well. He has even been known to read Harry Potter on the way to school and once carried a tray of cookies for the ride without a single spill. The GSD has let me keep my sanity-saving bike ride every day while still handling the messy reality of life and stuff. Together we Get Stuff Done.